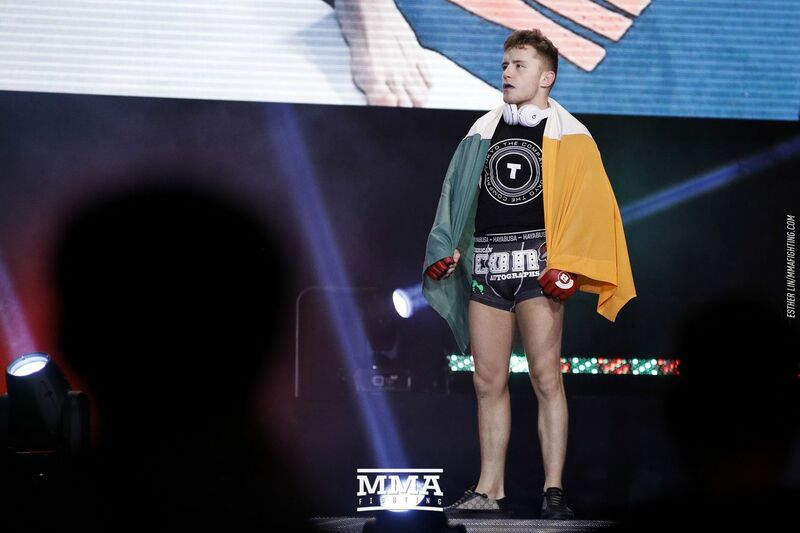 At only 20 years old, James Gallagher is dreaming big and planning to follow in the footsteps of his training partner Conor McGregor by becoming a two-division champion. On Saturday evening at Bellator 180, Gallagher had one of the breakout performances of last week, submitting Chinzo Machida with a rear-naked choke in a little more than two minutes. It was Gallagher’s fourth win in the Bellator cage but, more than that, Gallagher believes it was a turning point for him. On the biggest stage of his young career, Madison Square Garden, “The Strabanimal” turned in his most impressive performance and proved to himself that he’s ready to do great things in the sport. Immediately after his win, Gallagher called out Bellator featherweight champion Patricio Freire, who responded favorably, but it looks like for now, 145 pound title aspirations will have to take a back seat because the undefeated featherweight says he’s dropping down to 135 pounds to come after Eduardo Dantas’ belt first. Gallagher has never competed at bantamweight before and even had an amateur fight at lightweight. When asked if Bellator or Scott Coker had any thoughts on his plan, Gallagher admitted he hadn’t run it by them yet but that he couldn’t see why they would have an issue with it since he was the guy who would put the Bellator bantamweight division on the map. Whether that is true remains to be seen but the Northern Irishman is certainly starting to bring attention to himself and his planned drop to 135 pounds will likely bring more. As a brash talking, confident young man training out of SBG Ireland, Gallagher is already evoking comparisons to his teammate, two division UFC champion Conor McGregor and his intention to drop to another weight class will only deepen the comparisons. And while Gallagher admits that following in McGregor’s footsteps is certainly on his mind, he also says the weight drop is a matter of practicality: the shortest path to his ultimate goal, 10 pounds of gold around his waist. Following in the footsteps of McGregor is already an ambitious undertaking but Gallagher plans to do it even better. McGregor won his first title, the Cage Warriors featherweight belt, at 23 and followed that up six months later by winning the lightweight title. Gallagher plans to do both before he turns 22.